Ballot box snatching, non-availability of voting materials mar Kwara LG Poll – Royal Times of Nigeria. As Kwara state residents troop out in large number to cast their votes for chairmanship and counsellorship positions in the state, voters have expressed unhappiness at the delay of accreditation and non-availability of chairmanship report sheet in some areas. There have been reports of ballot box snatching at Igisogba-Orisumbare polling unit in Adewole area. Some armed men were said to have stormed the area, and threatened those present before carting away with the ballot box. An INEC official said the election in the polling unit will be cancelled if the ballot box is not produced. There are also reports that chairmanship ballot papers were also not supplied to many polling centres in Ajikobi, Ojuekun, Sarumi, and Waraosin wards, while there were shortages of ballot papers and result sheets for the elective positions. Many youths in Adewole area protested round the street against the non-availability of the chairmanship report sheet. The youths also vowed not to allow election commence unless the chairmanship report sheets are made available. 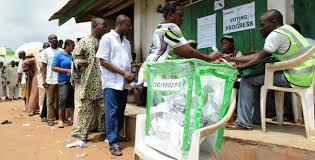 In Ilorin south, election activities were yet to commence due to absence of ad-hoc staff. Elections were also delayed in Magaji ‘N’ geri polling unit in Surulere area due to non-availabilty of KWASIEC stamp. Information reaching Royal FM, however, says accreditation commenced early in towns under Irepodun local government. Also, Kwara State Governor, Alhaji Abdulfatah Ahmed has cast his vote at his Adebiopon, Share Ward One, in Ifelodun Local Government. Meanwhile, Residents of Ilorin turned out in their numbers on Saturday for the local government election held across Kwara. Security personnel were stationed at strategic locations in Ilorin. Officers and men of the Nigeria Police, Army, Civil Defense, Immigration and FRSC were also stationed at polling booths to maintain order.